With a very small investment of time and money, you can now display 1090ES ADS-B air traffic (TIS-B) on Avare. There’s a good chance that we’ll soon see all available ADS-B data displayed on Avare in this way. This will probably work with most Android devices, though the process might vary on some devices. From what I’ve seen online, it’s likely that with a good quality OTG cable (about $7) and a good SDR (about $8) nearly anyone can have it working within a few minutes. Many people report success with the cheapest SDR & OTG available for well under $10 total. If you have no idea what an OTG or SDR is, no worries – I’ll provide a brief explanation and links to details on some terminology below. As you know, most ADS-B receivers cost somewhere in the range of $1,000 and many of them work great in Avare. Now for about 1% of that investment you can get some of that capability using a small USB stick with an antenna and a short USB adapter cable called an OTG (“On The Go” – a silly and pretty much meaningless name for an item that lets you plug more types of USB devices into many Android devices). The small USB stick is a receiver that works startlingly well and is called an SDR (aka RTL2832U or most relevant to this app: RTL-SDR). Basically it’s a very capable mass-produced USB broadband receiver originally designed for Digital TV in Europe that can be re-purposed via software to do thousands of other cool things, like ADS-B. Both the OTG and SDR have been available since Avare was introduced, but until now nobody had created the app to make it all work with Avare. The upside is that it’s amazingly cheap and easy. The downside is that right now unlike some of the expensive aviation receivers it’s only providing Avare with 1090MHz traffic (TIS-B) data (basically, airliners). Not yet very useful for GA, but if enough pilots are interested now the chances are quite good that full 978MHz ADS-B In UAT capability could be included within a few months. Currently it only provides 1090ES band reception for ADS-B Out international, Mode C & Mode S aircraft transmitting air to air. This does mean however, that most people can use it on the ground (often 978MHz data is only available in flight). Notes: My impression from reviews online is that the most likely problem with getting an SDR to work is a defective OTG cable, so I bought this “expensive” one. 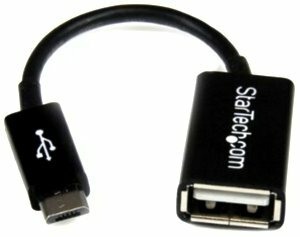 If you have trouble, trying a known good OTG cable would be a good place to start. 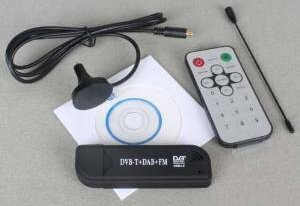 The CD wasn’t included in the SDR as pictured, but neither that nor the remote control unit are needed for anything but European TV anyway. The included antenna worked surprisingly well, and there are articles online about how to improve it or make your own. I saw several variations on this SDR hardware that look identical, though some show the outline shape of the black USB stick rounded at either the same or opposite top & bottom end corners – this is probably because you can insert the USB plug cap either way. Many reviews say the ones that look like this work fine, and recommend getting the cheapest one from a well-reviewed supplier. Indoors, about 4 miles East of SBA and 4 miles South of the commercial air traffic route over RZS VOR. 1. Assemble and plug in the SDR antenna, plug the OTG cable into the SDR and then into the Nexus 7. 2. Launch the ADS-B app. It immediately showed “Packages” being received (note that these screen captures are cropped to save space). The “Bad CRC” line basically shows the signal quality, outdoors or aloft with a better antenna the percentage would be lower, and “Bad” data is automatically rejected by the app. After a few seconds I tapped the Data button and saw an ICAO number, speed and heading in what is apparently called a “Frame” (paragraph). 3. 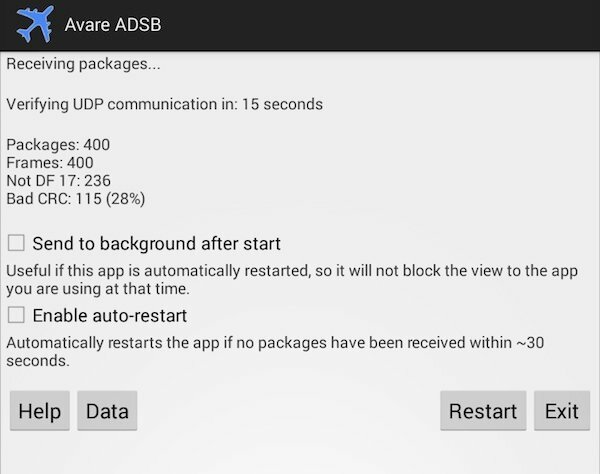 Launch the Avare I/O app, tap the WIFI button and the Listen (43211) checkbox. Though we’re using the WiFi section in this app the actual connection is via USB and no WiFi is available from the SDR, so WiFi on the Nexus 7 (or other Android device running Avare) is not needed. You can leave the Android device WiFi off and in “airplane mode” to save battery. 4. 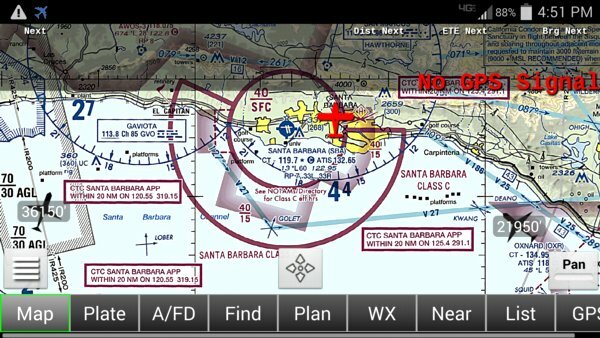 Launch the Avare app, tap the Options button, then the Preferences, Display, and Show ADS-B Traffic buttons, and return to the Map display. Air Traffic is shown as a jet icon at the bottom-right, beneath the small gray rectangle containing 36025′ in white text. Because no other traffic is close to this jet transmitting ADS-B Out, GA traffic much lower at those coordinates is unlikely to show up because few have ADS-B Out. These were taken within perhaps a minute of each other as I switched screens, and I’ve cropped them to save space. I think the Avare target shown next to KWANG intersection bottom-right at 36k’ was out of the LA area northbound. *The antenna supplied with the SDR is designed for European TV reception, and is almost certainly not the correct length for either of the ADS-B frequencies. So I was surprised that it works at all, especially indoors. One trick I saw in an Amazon review is sticking the magnet base of the antenna to a small ~2″ diameter tin can, and that might be a quick way to reduce the “Bad CRC” number to get quicker & smoother target tracking. *Commercial traffic within about a 35nm radius was displayed. There are mountains in the SBA vicinity that might be blocking transmissions, so longer ranges with more targets might be seen aloft or on flat terrain and of course with a better antenna. *Battery use was fairly high. In this brief (perhaps 45 minutes) test about 15% of battery capacity (from 65% at start down to 50% at end) was used. The SDR gets warm, so it’s using considerable battery power. An external powered USB hub to supply the SDR (and ideally also the N7) might be prudent for most flights. If you have or buy such a hub that works well for providing power to both the SDR and your Android device while also passing the data between them (i.e. it works), please post the hub’s make and model to the Apps4Av Forum. The Nexus 7 used 15% percent of its battery capacity during this 45 minute test. Since I fly with screen brightness at 100% that’s what I used for this testing. Afterward I closed all apps and left the SDR plugged in (and warm), and with screen still on and full brightness it took four minutes for battery percentage to drop from 45-44% which was much less battery use than I’d anticipated. It would surely be different on a phone or other device that doesn’t have the beefy battery in the Nexus 7, but you’d get better results with the screen turned down or off when not needed in flight. *UPDATE: I tried this same SDR on my Samsung Galaxy S4 phone (at home as above), and it was showing these two targets within a minute. The battery went from 89% to 86% in the 5 minutes it took me to do the test, again with screen at full brightness. Looks like this could work on battery long enough to be useful in flight, at least as backup. *The app’s current 1090MHz frequency is only showing a very small portion of traffic (ADS-B Out), nearly all of it commercial jets. It is also not currently showing all the other UAT services provided by the FAA on the 978MHz frequency (weather, TFRs, etc. ), though that could be added. 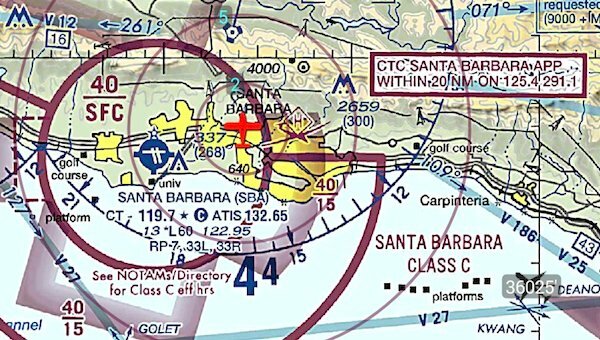 You can find a concise and mercifully brief summary of ADS-B in this recent AOPA article and this more extensive FAA FAQ. *The app is also less useful right now unless you pay for the “pro” version since the free version times out and requires a Restart. Then it takes a while to re-acquire enough data to reliably show this limited traffic on Avare. In actual flight for most situations you’d do far better (and be much safer) to just look outside and ask ATC for flight following. 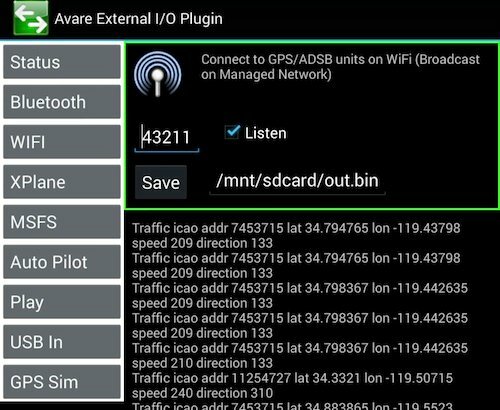 If all the UAT data isn’t soon provided to Avare by this new app, other SDR apps will probably be adapted to feed the entire UAT data stream to Avare making the $10 hardware investment much more useful. But … for this very small investment of time and money right now you will have a portable ADS-B that shows commercial traffic. Very cool toy to show other pilots, play with at home or on a walk, and when you’re flying in busy airspace: to pre-spot the heavies and impress ATC. When I transition LA airspace to MYF, now I’ll know in advance when there’s an airliner inbound for LAX or BUR and plan accordingly. If you ever fly in congested airspace, you’ll also see a lot more traffic because those jets with ADS-B Out will illuminate all detected traffic in their vicinity. When you finally have ADS-B Out in your aircraft, you’ll already have everything you need to display all identified traffic in your vicinity and you’ll be familiar with using it. You’ll also be encouraging Mike and the other developers to expand and improve the ADS-B options for Avare. It’s really exciting to see any ADS-B traffic for an investment in the range of $8-15 and ten minutes to install and set up. The app is quite easy to install and use, because Avare automatically displays any detected traffic right on the current chart. It’s truly Wonderful that this SDR ADS-B app is open source. That fact seems sure to greatly expand the free and low cost ADS-B options for Android devices going forward. Thank you, Mike Hammer of HIZ LLC and the Avare development team! 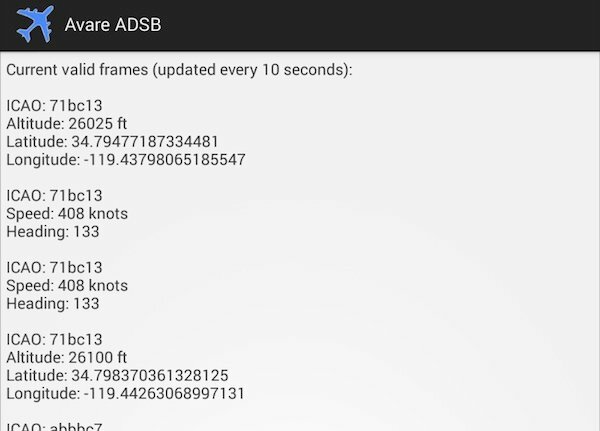 Once the other ADS-B data channel has been added to an SDR app, because Avare already supports it, anyone who has this cheap hardware in an aircraft with an ADS-B Out transponder will get all of the ADS-B weather, traffic and other data now available. This means aircraft can be equipped with the least expensive ADS-B Out transponder available, rather than those linked to a complex and expensive panel receiver/display. It also means pilots who rent ADS-B Out aircraft won’t need to learn and use those complex panel units to get all the benefits of ADS-B on Avare. Just hook up the simple and powerful Android device & SDR you carry in a pocket of your flight bag, and take off.